The Commander-in-Chief of the Syrian Democratic Forces Mazloum Abdi. (Asharq Al-Awsat). He described president Trump’s decision to withdraw US forces from Syria immoral. .
“This is something immoral, leaving your ally in the battle alone,” a Syrian Kurdish leader said. The voice of Gen. Mazloum Abdi, the Kurdish commander of the Syrian Democratic Forces militia, is tight and controlled as he describes President’s Trump’s decision to withdraw U.S. troops from the country and leave America’s allies to their fate. Mazloum explained the dangers of a terrorist resurgence after Trump’s sudden decision. Islamic State communications last week showed new hope they can restore their caliphate, which was on the way to destruction, he said. What’s more, Mazloum has been holding more than 2,200 Islamic State prisoners, including 700 foreign fighters. Without help from the United States and other coalition members, those deadly fighters may eventually escape. Mazloum is a tough, unsentimental commander, in his early 50s, with tight, curly hair and a pitted face. When I’ve met him on past visits to Syria, he conveyed a quality of calm and deliberative judgment that’s rare among militia leaders in that part of the world. The Kurdish fighters have an almost cult-like commitment to follow his orders and hold their ground, no matter what. This willingness to fight and die under U.S. guidance has made the Kurdish-led forces unique allies. With American air support, SDF fighters destroyed the Islamic State’s capital of Raqqa and all its major strongholds. The Kurds and their Syrian allies paid a severe price: They have suffered about 4,000 dead and 10,000 wounded since 2014. Over that same period, the United States lost only three soldiers in Syria, according to a U.S. military spokesperson. What astonished me most during our hour-long conversation was that Mazloum’s forces continue waging their bloody campaign against the remnants of the Islamic State in eastern Syria, even though his fighters want to return home to Kurdish areas and protect their families. Mazloum said his forces had suffered at least 27 killed in action since Trump’s abrupt decision, and many more wounded, as a revitalized terrorist adversary sent a wave of more than 10 suicide attacks against Mazloum’s front lines. “Right now, we are fighting for ourselves, for our existence,” Mazloum said. 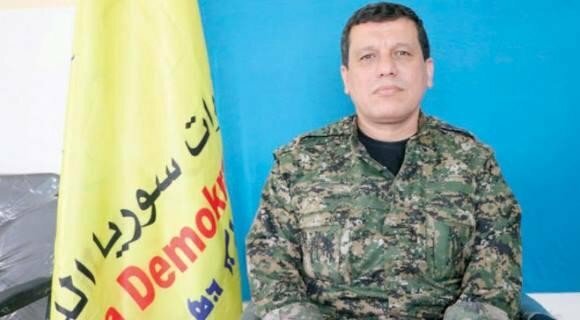 “Because all our fighters know that if they don’t defend themselves [the Islamic State] will come back and be stronger, murdering and beheading their families.” He said the threat was especially severe for the Arab members of the SDF coalition who fear reprisals from both Sunni terrorists and Iranian-backed Shiite forces. Mazloum believes that Trump made a deal with Turkish President Recep Tayyip Erdogan, who has threatened to invade Kurdish areas and destroy what he claims is Kurdish terrorism. Mazloum said he advised his commanders that this agreement was made by U.S. politicians, not soldiers. “This is something immoral, leaving your ally in the battle alone,” he said, something American soldiers would never do by choice. I asked Mazloum what he would be doing the following morning. He said he planned to go to the front lines, to bolster the morale of his 10,000 troops still battling the Islamic State. In this holiday season, when we think about keeping faith, that’s the kind of ally we are betraying.